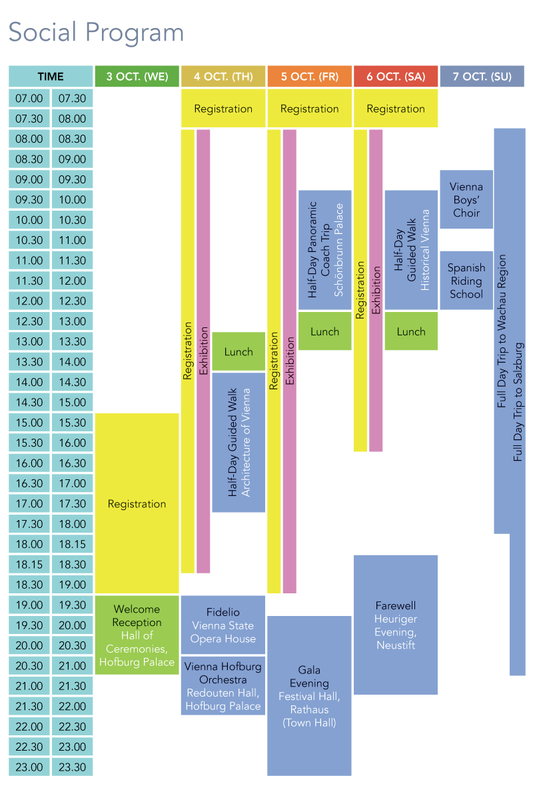 The Welcome Reception will be held in the centuries-old Hall of Ceremonies ("Zeremoniensaal") of the Hofburg Palace. Formerly the throne room of the ruling Habsburg family, the beautifully-ornate Hall of Ceremonies has perennially played host to balls, concerts, exhibitions and other presitigious events. 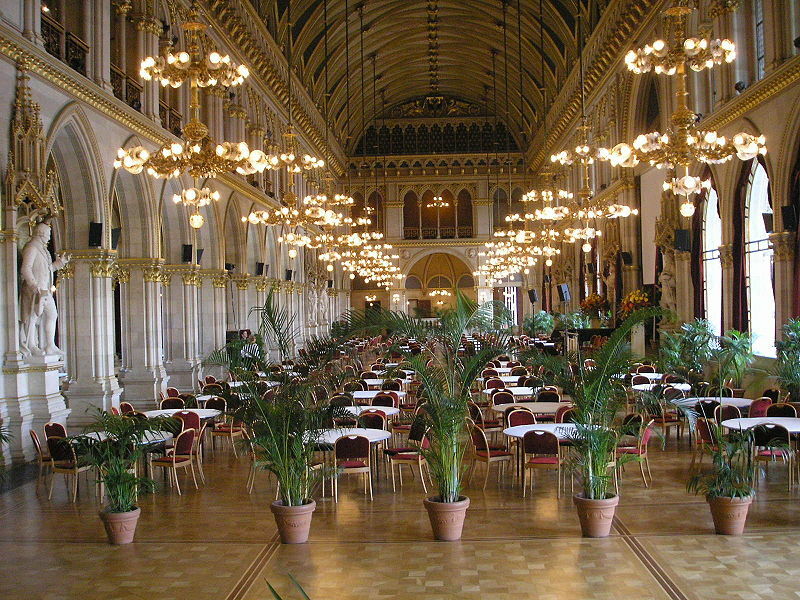 At the time of its construction in the late 19th century, the Festival Hall ("Festsaal") of Vienna´s town hall ("Rathaus") was the largest in the country. With its distinct architectural features such as the vast barrel-type vault ceiling, the Festival Hall is befitting as the venue for our Gala Dinner exclusively for symposium delegates and accompanying parties. 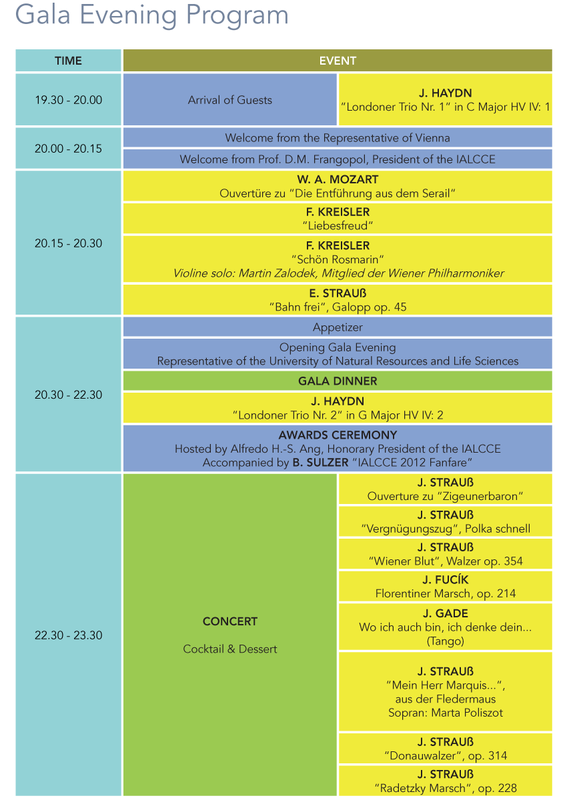 The program of the Gala Evening will also include the IALCCE 2012 Awards Ceremony. The Vienna Hofburg Orchestra boasts 36 professional orchestra musicians and 6 international vocal soloists. In one of Vienna´s most beautiful concert halls, the Vienna Hofburg Orchestra will present the most popular waltz and operetta pieces by Johann Strauss, Emmerich Kalman and Franz Lehar, as well as opera aries and duets by Wolfgang Amadeus Mozart. The Vienna Opera ("Wiener Staatsoper") is one of the world´s most famous opera houses. It was opened in 1869 with the world premiere of Mozart´s Don Giovanni. The members of the world famous Vienna Philharmonic Orchestra are recruited from the ranks of the Vienna State Opera Orchestra for the performance of Beethoven´s "Fidelio". In Austria, the current year´s wine is served in the legendary wine taverns (Heurigen), and the Fuhrgassl Huber ranks among the most famous in Vienna. Based in the Neustift district amongst a maze of rustic vineyards, visitors can enjoy the unique Wiener Gemütlichkeit (relaxed, companionable coziness) over a glass of local wine. The Heuriger is also a popular dining venue amongst locals, where guests can enjoy a fine selection of sauerkraut, dumplings and salads and various meats such as barbecued chicken, knuckle of smoked meat, lean loin, rost cumin and neck of pork. Transport to the Heuriger will be by bus. The meeting point for the bus transfer will take place at 18.15 at the Hofburg Heldenplatz in the 1st district, next to the main entrance of the Österreichische Nationalbibliothek. The bus trip back to Heldenplatz will leave from the Furgassl Huber at 21.15, with an expected arrival time at Heldenplatz of 21.30.